Weight gain during menopause is a frustrating symptom that may drive many women to look for quick solutions to shedding the extra pounds. With all the hype there has been throughout the years over the connection between green tea and weight loss, one can't help but wonder if it really works? Continue reading to learn more about if green tea fosters weight loss, how to consume it to reap the most benefits, and other solutions to get down to a healthier weight during menopause. Yes, green tea does promote weight loss, and it is believed to do so in a couple of primary ways. 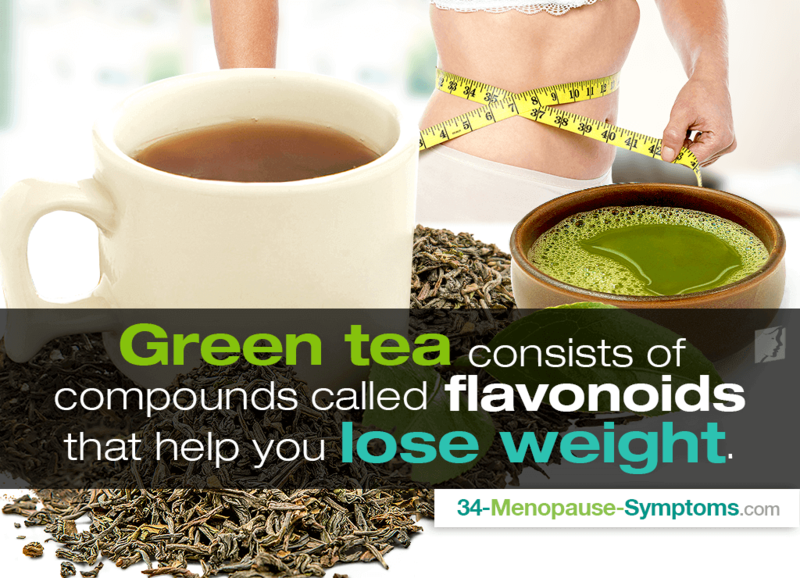 Green tea consists of compounds called flavonoids that help you lose weight. They have been scientifically studied to improve insulin activity, increase metabolic rate, and elevate fat oxidation, all helping you increase fat burning. Also, green tea contains trace amounts of caffeine, which can slightly boost weight loss or prevent weight gain by suppressing appetite and burning calories. How Do I Drink Green Tea for Weight Loss? Popular to contrary belief, you don't need to drink excessive amounts of green tea to help you lose weight. Research has found that as little as two and a half cups a day can encourage weight loss. Moreover, be sure as not to over boil the tea. The correct way to steep green tea is to boil water. Wait for the water to cool for about 10 minutes. Then, pour this over the tea leaves, letting it brew for one minute or longer depending on desired strength. Finally, some varieties are better than others when it comes to weight loss and general health benefits of green tea, such as Matcha. Matcha green tea has been found to contain highest amount of nutrients and antioxidants. What are Other Solutions to Weight Loss? While it may be tempting to flock to diets that promise quick weight loss, the most effective way to shed pounds during menopause is by targeting the underlying cause of hormonal imbalance. Weight gain treatments during menopause focus on first making healthy lifestyle adjustments, which include eating smaller portions more often; exercising at least five days a week, 30 minutes a day; and consuming an abundance of phytoestrogens, plant-based estrogens found in tofu, legumes, flaxseed, nuts, and more. For optimal results, combine your healthy efforts with phytoestrogenic herbal supplements or hormone-regulating supplements. Phytoestrogenic supplements - such as black cohosh and red clover - contain higher concentrations of phytoestrogens than their food counterparts, while hormone-regulating supplements, like Macafem, help nourish the endocrine and pituitary glands to produce their own hormones. Menopausal women looking to shed the extra weight they've gained throughout the transition out of their fertile years may see a ray of hope in green tea weight loss stories. While there is a bit of truth behind them, since green tea's flavonoids and caffeine can help with weight loss, it's important not to expect drastic results on its own. There are more effective solutions to losing weight, starting by resolving the cause at fault, hormonal imbalance. Natural and effective treatments include lifestyle changes of an optimized diet and healthy habits paired alongside alternative medicine of phytoestrogenic herbal supplements or hormone-regulating supplements. Rest assured that with proper initiative taken, the extra weight won't be on for long.